Illinois Attorney General candidate Erika Harold addressed Republican supporters on Monday during a campaign visit to Image Air in Bloomington. Illinois Republicans say House Speaker Mike Madigan's last-minute campaign donation to Kwame Raoul is a sign Democrats fear Raoul could lose in the state attorney general's race. Raoul is seeking to replace Democrat Lisa Madigan, who isn't seeking re-election. 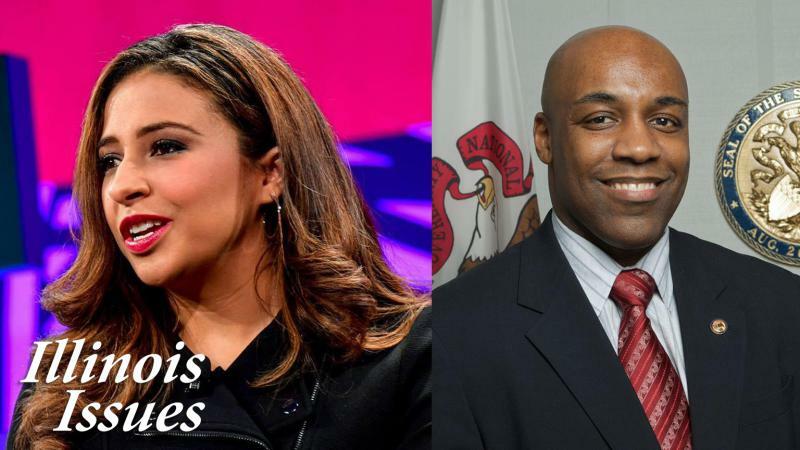 Raoul has led Republican Erika Harold in the polls, but at a campaign stop in Bloomington, Harold suggested the campaign gift from Madigan is a sign the House speaker wants to buy the election to ensure the attorney general's office remains under Democratic control. “My hunch is that after people see my opponent has received $1 million from Speaker Madigan on Friday, they will know which one of us has the courage to be independent,” Harold said. Harold campaigned with other Republicans in Bloomington as part of a final day Get Out The Vote flyover campaign across the state. Raoul, a state senator from Hyde Park, has outraised Harold, a lawyer and former Miss America, $12 million to $5.4 million. Raoul has received $2.9 million from the campaign of Democratic gubernatorial candidate J.B. Pritzker. Harold has received $2 million from Gov. Bruce Rauner's campaign. A spokeswoman for Raoul's campaign, Katharine Eastvold, dismissed GOP claims that the late contributions from Madigan was a sign of panic. "We're confident going into election day that voters are connecting with Kwame's consistent message about protecting access to healthcare and stepping up to oppose Donald Trump's assault on our rights," Eastvold said. " Attorneys general are more important than ever this year and voters understand what's at stake." The Republican governor has been campaigning separately from many of the GOP candidates in the final days before the election. He and Lt. Gov. Evelyn Sanguinetti campaigned in Decatur on Sunday. Rauner has a campaign event scheduled in Lisle on Monday afternoon. Republican U.S. Rep. Darin LaHood said his colleague Rodney Davis needs to win re-election to keep Nancy Pelosi from becoming House speaker again. “We are not going to let Nancy Pelosi take back that gavel, and re-electing Rodney Davis tomorrow is going to stop that,” LaHood said. Davis is in a tight re-election campaign against Democrat Betsy Dirksen Londrigan. It’s one of many U.S. House races Democrats are targeting as they try to flip 23 House seats to win control of that chamber. Londrigan is scheduled to visit her Bloomington campaign office on Monday afternoon to rally campaign volunteers in a final campaign push. State Sen. Jason Barickman said the GOP is counting on Harold to help other Republicans on the ballot. “We need to push her over the finish line to make sure she’s victorious tomorrow,” Barickman said. “With her leadership, she is going to help carry our candidates all around the state to victory." McLean County Democrats have also been making last-minute appeals to voters. Party Chairman Erik Rankin said the Democrats have a “Blue Army” of about 300 volunteers canvassing the county in the final days of the campaign to encourage support for their candidates. Republican candidate for attorney general Erika Harold says her recent comments at a coal energy conference in southern Illinois are not a signal she wants to ease up on environmental law enforcement. The Democratic candidate for Illinois attorney general said he supports much of the work Lisa Madigan has done in the 16 years in that office, but added there are some areas where he would focus more attention.